The amount of 1.2 USD has been deposited to your account. Accounts: U13195073->U1136717. Memo: API Payment. Withdraw to hyipsinfo from Capital-fx LTD.. Date: 10:47 28.03.19. The amount of 1.2 USD has been deposited to your account. Accounts: U13195073->U1136717. Memo: API Payment. Withdraw to hyipsinfo from Capital-fx LTD.. Date: 22:13 03.04.19. The amount of 0.6 USD has been deposited to your account. Accounts: U13195073->U5430333. Memo: API Payment. Withdraw to HotHyipsMonitor from Capital-fx LTD.. Date: 05:14 04.04.19. Batch: 254260059. The amount of 1.3 USD has been deposited to your account. Accounts: U13195073->U5430333. Memo: API Payment. Withdraw to HotHyipsMonitor from Capital-fx LTD.. Date: 04:38 06.04.19. Batch: 254554396. The amount of 1.3 USD has been deposited to your account. Accounts: U13195073->U5430333. Memo: API Payment. Withdraw to HotHyipsMonitor from Capital-fx LTD.. Date: 09:01 08.04.19. Batch: 254813739. The amount of 15 USD has been deposited to your account. Accounts: U13195073->U2631114. Memo: API Payment. Withdraw to MYINVESTBLOGER from Capital-fx LTD.. Date: 07:26 10.04.19. Batch: 255132239. The amount of 1.2 USD has been deposited to your account. Accounts: U13195073->U1136717. Memo: API Payment. Withdraw to hyipsinfo from Capital-fx LTD.. Date: 17:43 11.04.19. The amount of 1 USD has been deposited to your account. Accounts: U13195073->U2631114. Memo: API Payment. Withdraw to MYINVESTBLOGER from Capital-fx LTD.. Date: 19:31 11.04.19. Batch: 255405011. The amount of 1.5 USD has been deposited to your account. Accounts: U13195073->U5430333. Memo: API Payment. 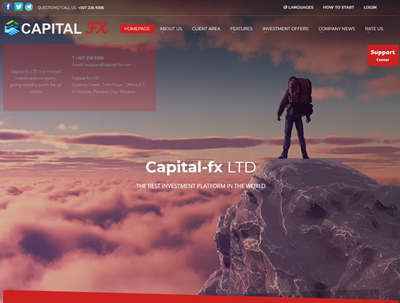 Withdraw to HotHyipsMonitor from Capital-fx LTD.. Date: 06:29 11.04.19. Batch: 255285523. The amount of 8 USD has been deposited to your account. Accounts: U13195073->U2631114. Memo: API Payment. Withdraw to MYINVESTBLOGER from Capital-fx LTD.. Date: 11:59 13.04.19. Batch: 255639921. The amount of 2.3 USD has been deposited to your account. Accounts: U13195073->U5430333. Memo: API Payment. Withdraw to HotHyipsMonitor from Capital-fx LTD.. Date: 07:22 14.04.19. Batch: 255731563. The amount of 1.4 USD has been deposited to your account. Accounts: U13195073->U2631114. Memo: API Payment. Withdraw to MYINVESTBLOGER from Capital-fx LTD.. Date: 14:02 15.04.19. Batch: 255912659. The amount of 4.6 USD has been deposited to your account. Accounts: U13195073->U2631114. Memo: API Payment. Withdraw to MYINVESTBLOGER from Capital-fx LTD.. Date: 12:51 16.04.19. Batch: 256074158. The amount of 9 USD has been deposited to your account. Accounts: U13195073->U2631114. Memo: API Payment. Withdraw to MYINVESTBLOGER from Capital-fx LTD.. Date: 11:27 17.04.19. Batch: 256230697. The amount of 1.3 USD has been deposited to your account. Accounts: U13195073->U5430333. Memo: API Payment. Withdraw to HotHyipsMonitor from Capital-fx LTD.. Date: 21:14 16.04.19. Batch: 256157442. The amount of 1.2 USD has been deposited to your account. Accounts: U13195073->U1136717. Memo: API Payment. Withdraw to hyipsinfo from Capital-fx LTD.. Date: 22:28 17.04.19. The amount of 3 USD has been deposited to your account. Accounts: U13195073->U2631114. Memo: API Payment. Withdraw to MYINVESTBLOGER from Capital-fx LTD.. Date: 10:17 18.04.19. Batch: 256383955.